Parth Dhebar (@pdparticle) is the Founder of Simple-Reviews, a blog that features simplified reviews for Apple iPad, iPhone, and iPod touch apps. You can also follow them on Twitter (@simple_reviews). Last week, Apple announced that a special event would take place on March 2nd at the Yerba Buena Center in San Francisco. Since the news broke, the media has gone on a non-stop publishing spree with unrealistic rumors. Here are five reasonable things we can definitely expect with the iPad 2. The upcoming iPad 2 will probably feature the next generation A5 processor, an upgrade to the existing A4. Apple will probably throw in a better graphics chip and double the RAM to 512 MB. To keep consistent with the iPhone 4, the new iPad will likely have gyroscope inside. Although some believe that Apple will outfit the iPad 2 with a dual core processor, it is probably not going to happen. Doing so would significantly harm battery life. While the tablet probably will not have a SD card reader, we may see a USB port due to popular demand from customers. Taking example from iPhone and iPod touch refreshes, the iPad 2 will definitely have a thinner body. Rumors have suggested that the tablet may sport a carbon fiber body or a similar material, which would make it much lighter. Apple’s recent acquisition of LiquidMetal patents backs that claim. After many complains about the original iPad’s weight and Apple would definitely have taken notice. During the WWDC 2010, keynote Steve Jobs introduced a front facing camera on the iPhone and the FaceTime platform for video calls. Since then, the technology has made its way to the iPod touch and Mac computers. With Google’s latest generation of Honeycomb tablets offering video calling, it would only make sense for Apple to bring FaceTime to the iPad 2. Although the iPhone and iPod touch feature the Retina Display, Apple will probably not add one to the iPad 2. While a high-resolution screen would be gorgeous, it would not be practical. Doubling the current resolution would mean 2048 by 1536 pixels, which is larger than 1080p HD content. Unfortunately, video content of that quality does not exist yet. A larger Retina Display would also demand more processing power for rendering graphics, which would take a major toll on battery life. Sure, with more than impressive sales figures, there is no pressure to lower prices. 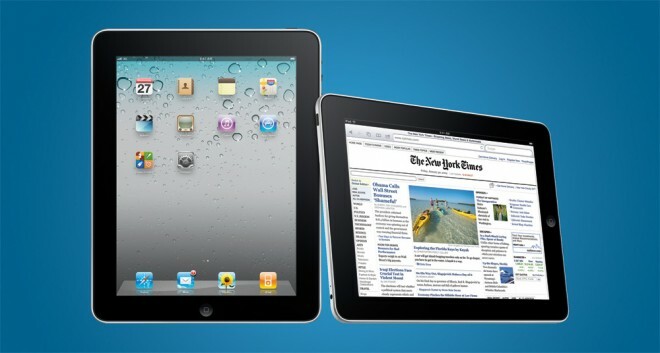 However Apple may drop the iPad 2 starting price to $399 to stay ahead of the game. This would also let them flood the market with the iOS platform taking market share back from emerging Android, BlackBerry, and webOS tablets. At the least, Apple will drop the price of the original iPad significantly. If you have been waiting to buy a tablet, the iPad 2 would be a perfect choice. The event is less than a few days away and I would definitely avoid giving into temptation for the current model. Although some rumors indicate that this might only be a slight upgrade to the existing version, it would be highly unlikely for Apple to deviate from their traditional 12 month-long cycle.